Heaven. That’s what these cookies will make you imagine. My mouth starts watering just thinking about these cookies. 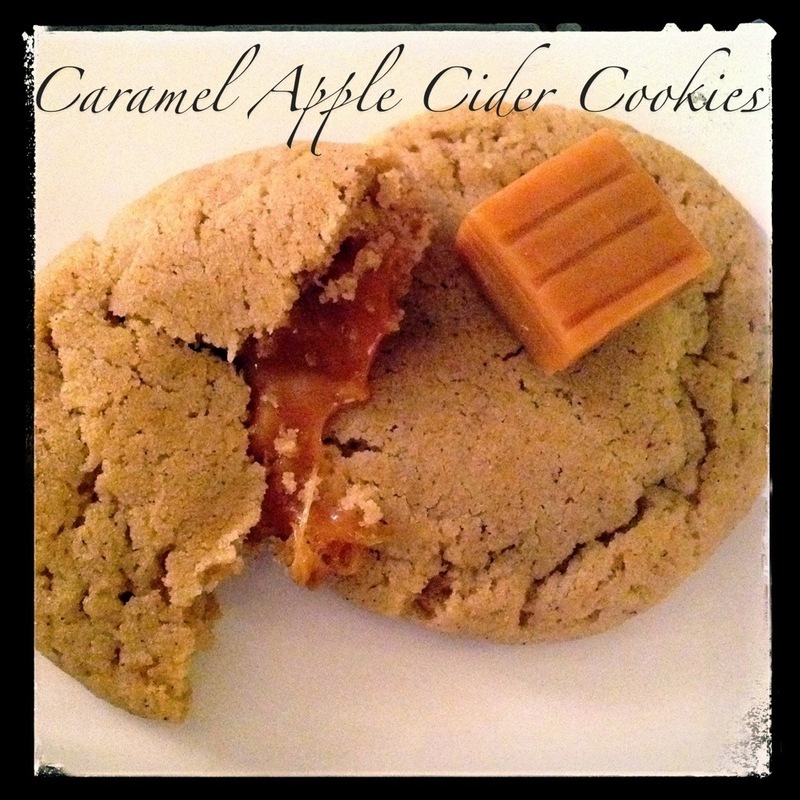 A warm, soft, apple cider cookie stuffed with ooey gooey caramel. Drool. I found this recipe on Pinterest a few weeks ago but hadn’t gotten around to making them yet. And then I got an email from my Foodie Penpal for the month, who said she loves caramel, and I figured these would be a special, sweet treat for her! I’ll be honest, these cookies are a teensy bit labor intensive. But every bit of effort that you put into making these perfect cookies will be rewarded tenfold. Easily. Not to mention the recipe makes nearly 4 dozen cookies – enough to devour on your own and share with your friends and family. Or anyone else that you’re trying to impress. Check out the recipe below. Come back after you make these babies and let me know how much you love them! Yield 4 dozen. Adapted from Scrambled Henfruit. Preheat oven to 350 degrees F. Line rimless baking sheets with silpat or parchment paper. In a small bowl, stir together flour, baking soda, baking powder, and cinnamon. In a large bowl, cream together butter, sugar, salt, and all 10 packs of apple cider mix with a hand mixer until fluffy. Slowly beat in eggs, one at a time. Add vanilla, mix well. Gradually add flour mixture to butter and sugar mixture. Mix until just combined (don’t over mix!). Refrigerate for 30 minutes or until slightly chilled. While you’re waiting, unwrap the caramels. Use a tablespoon to scoop out dough balls. Slightly flatten the ball in your hands and place a caramel in the center of the dough. Gently fold the dough around the caramel and roll into a smooth ball. Place cookies on lined baking sheet, about 2 inches apart. Bake 10-12 minutes until cookies are lightly browned on the outside edges. Slide the silpat/parchment off of the baking sheet and onto the counter. Allow the cookies to cool slightly, the gently twist the cookies from the silpat and allow to cool upside down. I’d definitely recommend reheating these for a few seconds upside down in the microwave before eating after they’ve fully cooled. But be careful, the caramel filling gets hot quickly! Ohh my gosh. These cookies are gorgeous! Yum! !